A single hair on a gecko’s foot has enough “stickiness” to pick up an ant. Credit: Kellar Autumn, Lewis & Clark College. Sticky feet driving you up the wall? Well, maybe not. But they are for Cicak, or Gecko-Man. After a few sips of coffee contaminated by a virus-infected gecko, a loser lab scientist suddenly becomes a Malaysian superhero, sticking to walls, using his tongue to scale skyscrapers and even eating bugs. 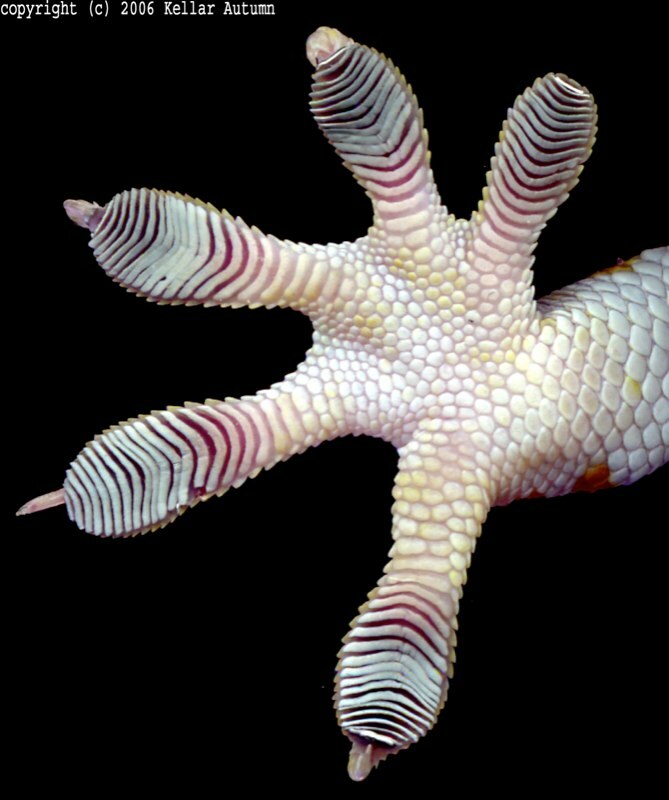 “Gecko feet are nature’s best adhesion and removal device,” said Lewis & Clark College biologist Kellar Autumn. He gave the keynote speech during the awards ceremony of the third annual Abhijit Mahato photo contest on Nov. 7. While Autumn riled up the audience with his images and videos of the science behind gecko feet and their inspiration for new adhesives, robots and superheroes, he also used the talk to remind the photographers in the audience that appearance and scientific images can be misleading. The science of how geckos climb up walls and across ceilings is at least a 200-year-old question, one that even Aristotle tried to answer. In the late 1960s, one scientist took some scanning electron microscope images of gecko feet and thought they revealed suction cups as the mechanism that let geckos scale walls and ceilings. But that idea was wrong. It wasn’t until Autumn and his collaborators began looking more closely at the creature’s feet in the late nineties and early 2000s that scientists realized it wasn’t suction, but nanometer-scale interactions between a surface and the gecko’s foot hairs, or setae, that let them stick, release and climb. His team took a single gecko foot hair and made the first direct measurement of its adhesive function. Turns out the stickiness in one hair is so strong it can lift the weight of an ant. 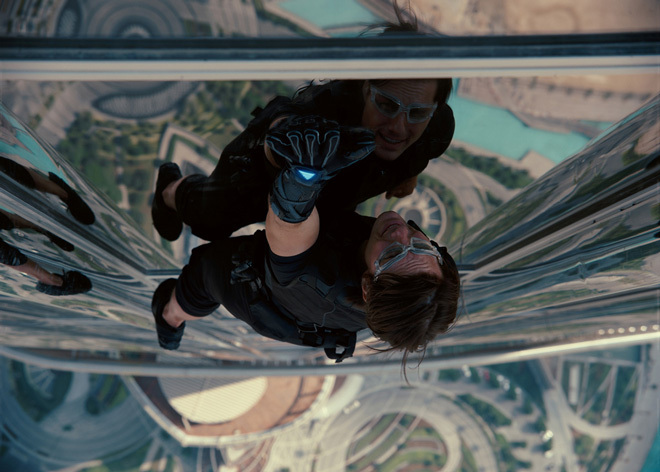 Tom Cruise climbs a skyscraper with “gecko gloves: in MI:Ghost Protocol. Image courtesy of: Danny Baram. He showed videos of both the kinematics and kinetics of the way geckos climb and compared and contrasted the physics the creatures use to the human-engineered “nanopimples” and wedge-shaped nanoridges that resemble geckos’ sticky feet. The animal’s foot physics is “different than pretty much everything else out there,” Autumn said, though he did describe several developing projects to try to mimic the animals’ movements. Still, he said, he’s convinced that “had geckos not evolved their sticky feet, humans would not have invented adhesive nanostructures.” And, there’s no way we’d have gecko gloves or could even think of gecko band-aides and the other cool applications of gecko-feet science, he said. “Adhesive force of a single gecko foot-hair.” Autumn, K., et. al. (2000). Nature 405, 681-685. “Evidence for van der Waals adhesion in gecko setae.” Autumn, K., et. al. (2002). Proc. Natl. Acad. Sci. USA 99, 12252-12256. “Evidence for self-cleaning in gecko setae.” Hansen, W. and Autumn, K. (2005). Proc. Nat. Acad. Sci. U. S. A. 102, 385-389.